Workplace is a whole world in itself. People coming from diverse backgrounds, with different experiences, having distinct personalities; all stacked together in a notional hierarchy; reacting towards ever-increasing demands of an ever-changing marketplace. Well! In such a setting, conflicts are inevitable. If you see, most of the conflicts are interpersonal in nature. 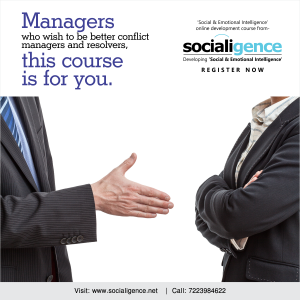 Their roots lie in attitude, behavior or conduct of a person.To address or solve them, what a manager requires is ‘Social & Emotional Intelligence’. We, at Socialigence, define itasthe “Ability to adapt one’s behavior on the basis of awareness of one’s own emotions and attunement with others’ emotions”. Do not be in a haste to solve the matter.